Internet Captcha is designed to protect your html forms where users send information to others users or databases. A informatic robot can automatic send a lot of information, saturating your system or it can send you spam continuously to publish. With this captcha only human can complete the security code and only a human will be able to use your web page. WHY DO YOU MUST USE THIS CODE? The Internet Captcha is free to put in your web. Security level is configuable too, you can fix distortion, number turn, distance betwen numbers and doping elements to make difficult automatically detect the code. The captcha is validated in the main form and if you fail the correct code, the system can be generate other code in the same page whitout reload. 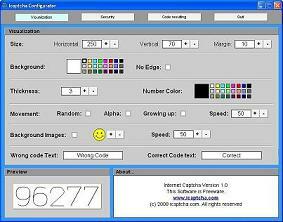 The captcha no need alter any image in memeory and have low cpu usage to the server. Icaptcha is HTML5 compliant and it is compliant with more famous browsers including Internet Explorer 6 and upper. HOW COULD YOU PUT THE CAPTCHA? 1 - CONFIGURE YOUR CAPTCHA. 2 - PUT CORRECT FILES IN YOUR WEB DIRECTORY. 3 - YOU HAVE YOUR WEB PROTECTED. IF YOU LIKE IT, SHERE IT.